In a continuation of the party I went to last weekend and catered as well – I am sharing the food that was prepared for 30 people. First off the party was amazing – my friends Jay and Jonathan live in Cambridge Ontario and have a fabulous historic home on a huge lot so the evening was spent under a pergola on the deck and then on the grounds for a big bonfire as the evening got cooler. Too much fun was had by all. Last weekend I posted the stuffed dates and salad (truth be told the salad was for another event but I liked the way it turned out). This week are all of the foods I prepared. Remember everything was to be finger food style so plates and cutlery were not a necessity. Here was my thinking behind the choice of dishes I made. I wanted food that could be eaten with fingers (i.e. 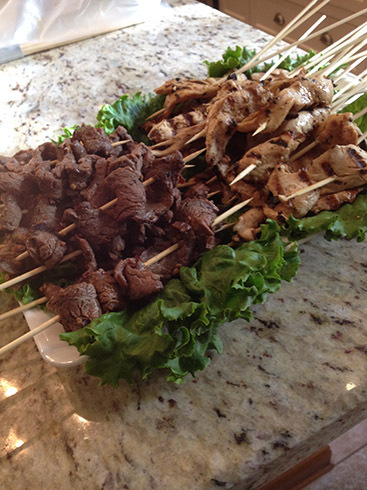 on skewers) and to cover the basics of salad, main course meat/fish, side dishes and then dessert. The while I had the above order in mind – we put everything out together as it worked better for people to just come to the table and pick their choices. 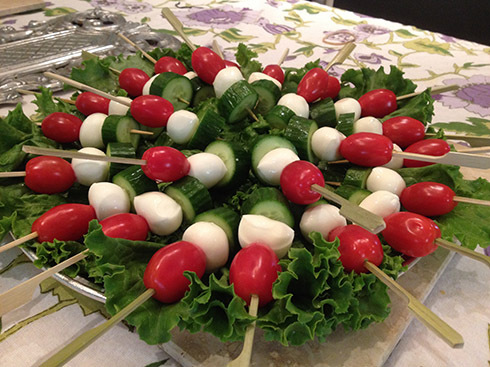 First off salad skewers made with grape tomatoes, bocconcini cheese balls and chunks of baby cucumbers. Just before serving I drizzled some balsamic glaze over these skewers. 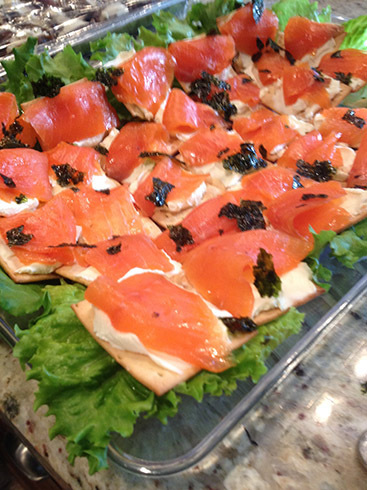 Next on the list was smoked salmon with cream cheese on crackers with some crushed dried nori (seaweed strips) sprinkled over top. Then came Korean grilled beef skewers and the honey mustard chicken skewers. Below is the recipe for the meat – the Korean Beef is now a new favourite – everyone went nuts over it. I did the prep work for the meat the day before and marinated for 24 hours in ziplock bags. So the honey mustard chicken is simple – just mix about a ¼ cup of honey with about 1/4 cup of olive oil and about 4 tbsp of dijon mustard – adjust to suit your taste. I also added a few crushed garlic cloves and some ground black pepper. I used 6 chicken breasts cut into thin strips lengthwise so there was enough to put on a skewer. 1. Combine the soy sauce, sugar, white wine, chopped garlic, toasted sesame oil, and crushed red pepper, stirring to dissolve the sugar. Add the sliced flank steak and coat thoroughly in the marinade. Cover and refrigerate the steak for at least 4 hours or overnight. 2. Working in batches, grill the steak over high heat (I BBQ’d it) until the slices are richly browned and medium-rare, about 30 seconds per side. 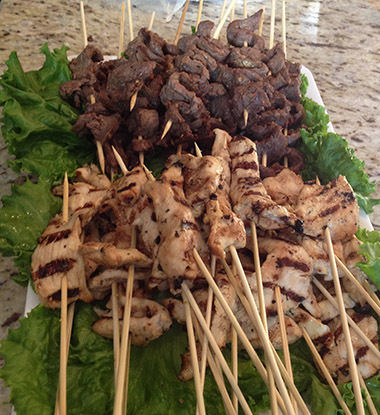 Put pieces on a plate and let them cool – then put them on skewers just before serving. 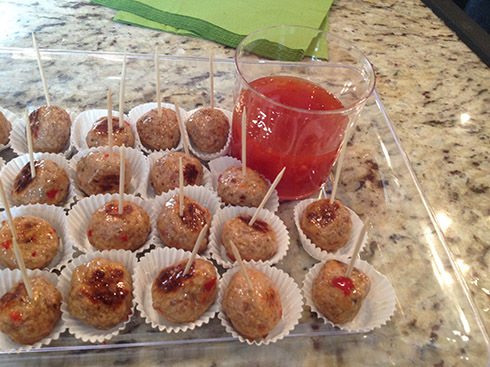 Next was mini turkey meatballs in a sweet chilli sauce – this is my usual baked turkey meatball recipe but just made them smaller and tossed them with a store bought sweet chilli sauce instead of tomato sauce and put some into a cup for dipping as well. 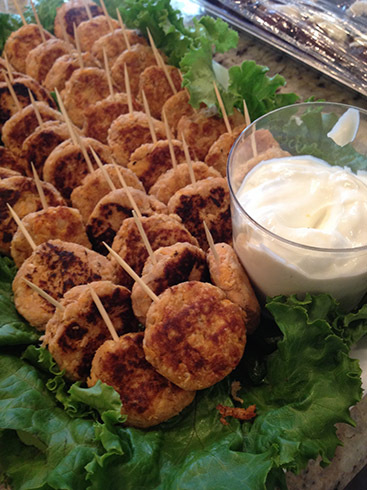 Next on the menu was my tuna and sweet potato cakes but made mini size and a cup of 1% yogurt for dipping. I then thought I needed something else that wasn’t meat and what do people love more than shrimp? 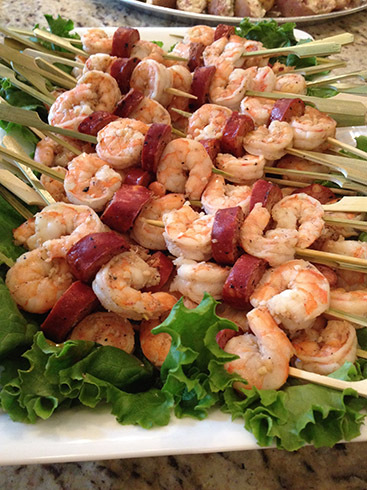 Again I had a craving for shrimp and chorizo sausage so that was the next group of skewers. 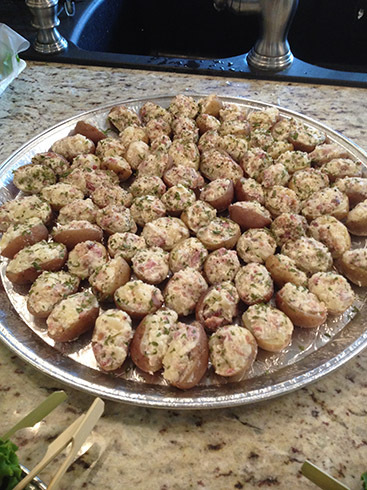 The side dishes were baby stuffed potatoes where you just boil the baby potatoes, then scoop out the centre leaving a bit of potato to hold the shape and then mix crumbled cooked bacon, chives and sour cream with the bits of potato you have scooped out . Once it is all mixed just spoon it back into the potatoes. This was quite finicky but tasted good in the end so worth while. Last of the main course food was grilled asparagus wrapped in prosciutto. 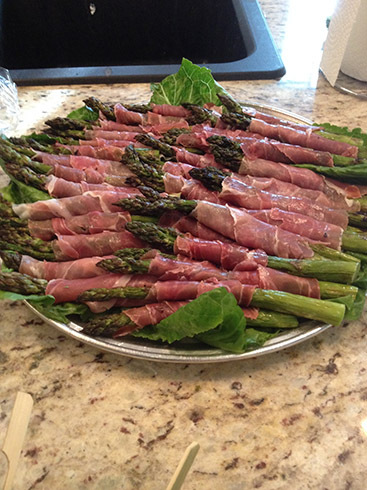 Simple and easy – just toss the asparagus in olive oil, then grill them (I did them on the BBQ) and then wrap a couple of stalks in a piece of prosciutto and you are done. 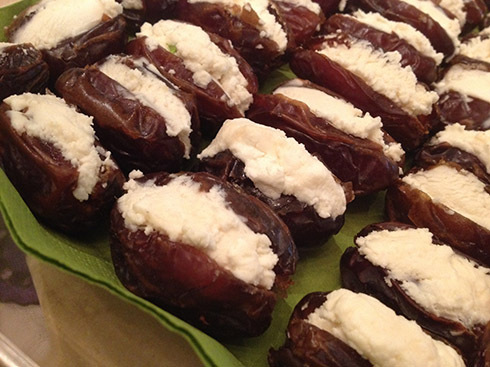 Finally dessert – you saw the dates in my last post (I will put in again just so you see them). 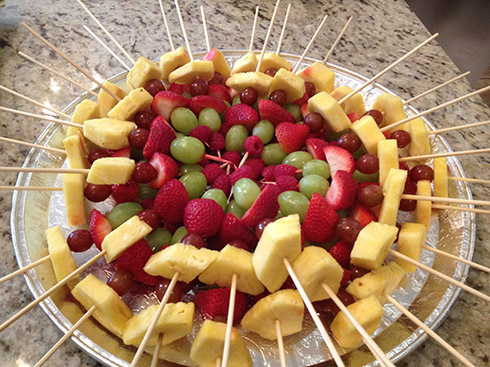 I put fresh fruit on skewers so they could be taken away from the table and you got several pieces at one without a mess. Each skewer had a slice of pineapple, a green grape, a strawberry, a purple grape and a raspberry. You can make these with any fruit you like. And there you have it the whole party in food. What I am not showing is the amazing evening we all had. Great company, kudos to the hosts and all I can say is “when is the next party”? Creative cooking with a fresh approach to all things edible.